Here's a superb new online slots game here on Slotsbaby. Sink your teeth into the Phantom’s curse and enjoy one of NetEnt’s latest installations on the market. Phantom’s Curse has the usual 5 reel set up and comes adept with up to 40 changeable pay lines. This means there’s prizes to be won across each and every spin. 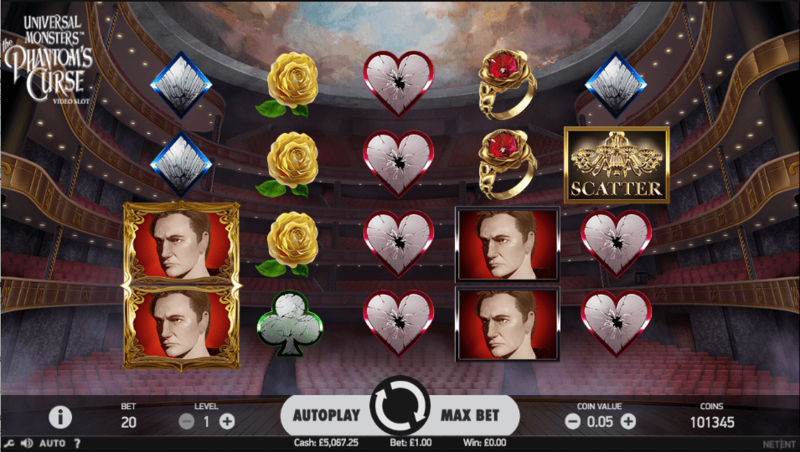 This classic Slots games also draws significantly on the Phantom of the Opera, with mirrors, masks and characters making up the majority of the symbols across the gameboard. Get the best out of slots offers before you play the game! Standing tall with five exuberant reels and a beautiful ensemble of 40 paylines, the Phantom’s cure is purely a wonderful game. Personally, I know nothing about the Phantom of the Opera which is perhaps a good thing for all you slot gamers out there. If you hadn’t already pieced together the theme then this game is based on the Phantom of the Opera. Lovely stuff. The game also features a soundtrack that links up music from the musical as well as the motion picture film. Additionally, there’s also a lovely little smoky effect that looms in the background of the gameboard which makes this game feel oh so atmospheric. Now onto the juicy specifics. 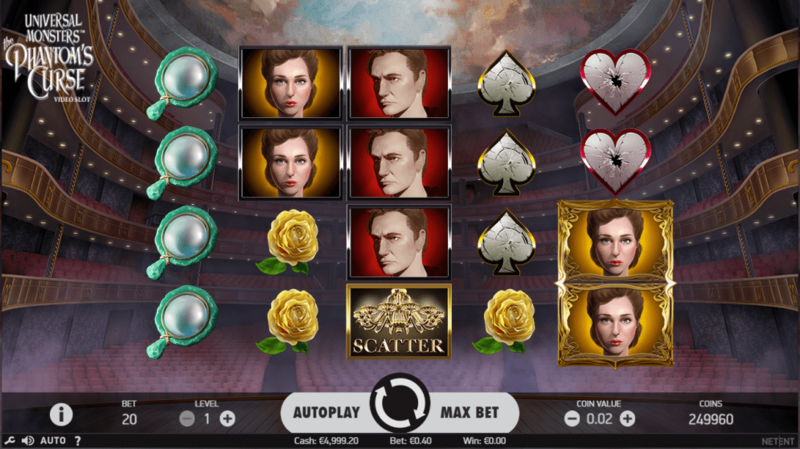 Enjoy the pick and click option of this game, a section where you will pick between mirrors and roses to win up to 36 times your initial stake. Take advantage of the Masked Phantom re-spin feature where phantom symbols acts as WILDS. The benefit of the Phantom symbols is they can be stacked to win up to 800 times your initial stake. This 5 reel is set inside the cursed theatre and the gameboard is made up of symbols that include hearts, clubs, spades, and diamonds which are the lesser value symbols of the game and counter balanced with symbols including daggers, mirrors, sapphires, roses, sapphire rings and Christine from the musical. If Phantom of the Opera is your forte then you will certainly enjoy this new game from NetEnt. Featuring up to 40 paylines and your standard 5 reel set up this game certainly hits the ball out of the park in a way that not many other Netent games do. This slot game features all the signature graphic and animation of your typical NetEnt offering and is certain to become your new favourite spinner.